If the thought of sitting back in that big dentist’s chair sends you scrambling for a hiding place, don’t feel embarrassed – dental phobia is actually a very common problem. In fact, over 70% of Americans experience some level of fear or anxiety when faced with an upcoming appointment at their local dentist’s office. Dr. However, you don’t want to let those feelings keep you from receiving the crucial treatment your teeth need to stay healthy; after all, that could only result in worse problems that require even more time to fix. Dr. Joe Isaacson and his dedicated staff are committed to providing you comprehensive dental services that put your comfort first each and every time at their Oklahoma City office. That’s why we’re happy to offer multiple methods of sedation dentistry to our patients during their various services. With the help of sedation dentistry, you can receive the healthy and happy teeth you’ve always deserved – no worry required! If any of these characteristics fit you, we recommend that you discuss sedation dentistry options with Dr. Isaacson before undergoing a procedure. Do you need multiple, long procedures done as quickly as possible? 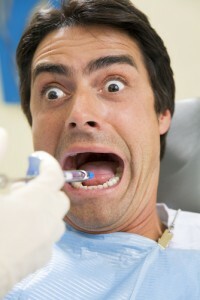 Do the sights, sounds, or smells of the dentist’s office make you feel scared or anxious? Do you have a sensitive gag reflex or suffer from jaw pain? Do you find it difficult to relax comfortably in a chair for a long period of time? Does the thought of going to the dentist’s office induce mild, moderate, or even severe anxiety? Dr. Isaacson is happy to offer both oral conscious sedation and nitrous oxide as comfortable and effective sedation dentistry options for his patients in Oklahoma City and beyond. We’ll discuss these methods in further detail in our next blog post! Learn more about sedation dentistry here, or call our Oklahoma City office today to schedule an appointment! Dr. Isaacson and his staff are committed to providing patients of all ages with efficient and effective care that’s sure to give you something to smile about. We also serve patients from surrounding OKC areas, including Edmond, Yukon, Piedmont, and Mustang.